When I met Achintya Bhattarcharjee last week, he was wearing an orange and black striped shirt. Abhijit has arranged for me to work with him on constructing the tigers for my project. He's an artist who is currently doing an MA at Rabindra Bharati University as well as being a traditional idol maker from Mandirtala, on the Howrah side of the city. 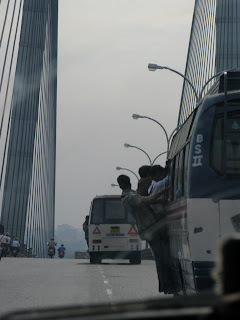 Mandirtala is just over the second Howrah Bridge and from Khoj is about 15 minutes on a clear run, 30-40 in rush hour. That side of the river is at least 100 years older than Kolkata, and is very different ... more like an urban village. I visited Achintya's studio on Sunday. We met at the bus stand and then we headed down a narrow street towards his house. There are some stalls at the start of his lane. A man selling chickens, a wire cage with about 50 chickens sit below his table. On top are freshly slaughtered and plucked birds. Next to the table a dog sat dozing with a delicate beard of white feathers. Achintya's studio looks out over a pond, surrounded by houses, with the odd small shop and local business. The path that runs around the pond can take a bike or a small cart but its mostly pedestrian traffic. I'm envious of his studio, it's perfect for sculpture. Earth floor, two large doors opening outwards, good light. On one side, his shelves are stacked high with plaster moulds for various features and components of the gods, goddesses and deities he makes during the puja festival season. Achintya told me that the work commences in July and runs right through to November, ending with Jagadharti Puja which was last week. His sister and brother-in-law live in the house next door and they treated me to tea, rasagullas and sandesh sweets. I also met two of his nieces. They were all curious about the project, and when I went back there again this morning, Achintya told me that his brother-in-law's mother who lives there as well, has taken a special interest in the tiger's well being and visits it twice a day, morning and night.